Theme: We are now faced with re-securitization of nation-state, the end of welfare state, revitalization of nationalism and xenophobia, and deficit of democracy and care work. In addition to them, in the context of Japanese society, we find that historical revisionism the emphasis on Japanese “tradition,” “morality,” and “family”, and the reinforcement of sexual division of labor have come along with neo-liberalism, especially a trend of privatization of public responsibility, that is, the enforcement of private responsibility. 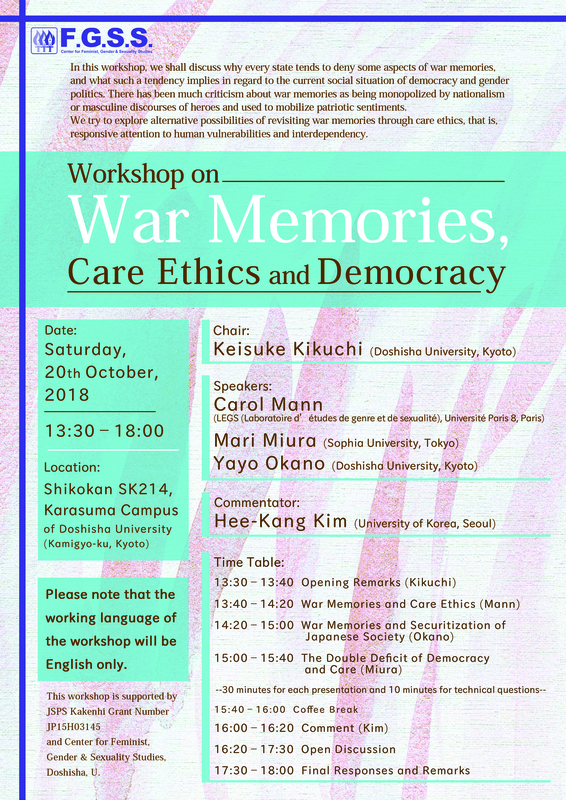 In this workshop, we shall discuss why every state tends to deny some aspects of war memories, and what such a tendency implies in regard to the current social situation of democracy and gender politics. There has been much criticism about war memories as being monopolized by nationalism or masculine discourses of heroes and used to mobilize patriotic sentiments. We try to explore alternative possibilities of revisiting war memories through care ethics, that is, responsive attention to human vulnerabilities and interdependency. We also try to find a theoretical link between deficit of democracy and deficit of care work. If deficit of democracy and that of care work are two faces of the same coin, what kind of state is it that is emerging now? Why should we still cling to the ideal of state? 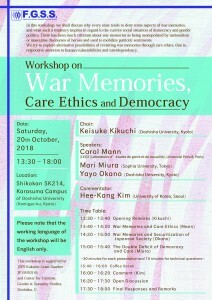 Can we overcome this double deficit by re-approaching war memories from the viewpoint of care ethics? These are the questions that will be explored during the workshop. Commentator: Hee-Kang Kim (University of Korea, Seoul). Please send your resume or paper to Yayo for Prof. Kim to prepare her comments by 10th October. The workshop is supported by JSPS Grant in Aid for Scientific Research (B) Grant #15H03145 and Feminist Gender Sexuality Studies Center of Doshisha U. Please note that the working language of the workshop will be English only.